Considered the home of the Garden of Eden and its own Formula 1 Grand Prix. A small island nation in the Persian Gulf and made up of 33 islands, Bahrain literally translates to “Two Seas”. 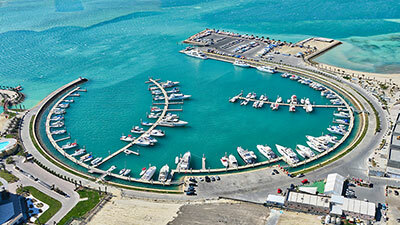 Once famed for its gorgeous pearls, the bustling ports of Bahrain are a hub for different cultures and traditions. A mix of Arabic, Persian and Western culture, the city of Manama is a gilded metropolis with shimmering steel skyscrapers and shopping malls. Enjoy the swish City Centre Mall or discover the spices, pearls and exquisite carpets of the traditional Manama Souk. A growing foodie destination, feast on savoury falafels and sweet dates or traditional lamb stuffed Ghoozi and rich baklava. Gahwa, or coffee, is a traditional welcome in Bahrain and is often made with coffee, cardamom and saffron. At the Bahrain National Museum, learn about the Persian and Portuguese past of Bahrain, or take a trip to the Al Fateh Grand Mosque, one of the largest mosques in the world.